The Hellenic Society for Cardiovascular Health (EEKY) and the Scientific Union of HYGEIA Doctors (EEIY) are organizing a one-day event on “The Latest Developments in the Prevention of Cardiovascular Diseases”. A one-day scientific meeting was held at the N. Louros Conference Center, MITERA Hospital, on June 28th, 2016 on “The Latest Developments in the Prevention of Cardiovascular Diseases”. 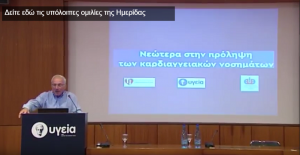 The event was organized by the Hellenic Society for Cardiovascular Health, in association with the Scientific Union of HYGEIA Doctors, and the attendees had the chance to watch interesting, important and useful presentations and vivid discussions. Although the cardiovascular epidemic of the 20th century seems to be receding in high-income countries, it is increasingly becoming exacerbated in low-income ones. In Greece, there have been no signs of the situation subsiding, while there are concerns that it may even be deteriorating. Despite the advancement of medicine, prevention is key to addressing this epidemic. It is a documented fact that lifestyle changes may potentially limit by 90% the risk of the epidemic spreading even further. However, the primary factors responsible for cardiovascular diseases, such as smoking, hypertension (only 20% of the population successfully regulates hypertension), bad nutrition leading to obesity, diabetes mellitus and hyperlipidemia have not shown signs of improvement in Greece. The evidence presented during the meeting demonstrated that contemporary knowledge must be converted into actions and transferred to everyday life.